‘Fruit long, rather slender, slightly tapering from the crown to the stalk, having an irregular and slightly knobby outline, in the manner of the Calebasse, about three inches and three quarters long, and two inches in diameter. Eye small, open, with slender segments of the calyx, slightly sunk in an uneven hollow. Stalk one inch and a half long, slender, recurved, and obliquely inserted in a two-lipped cavity. Skin dark green, almost wholly covered with an iron-coloured russet, on the sunny side of a dark rufous brown, thickly sprinkled with grey russetty dots. Flesh greenish yellow, melting, with an abundance of rich, saccharine, high-flavoured juice. Ripe the middle to the end of October.’ [George Lindley – Orchard Guide p.412/1831]. ‘An old fashioned dessert pear. Ripening October to November, sometimes later.’ [HP pl.XLII/1878]. I have no further information on its origins, but it was mentioned by Parkinson in 1629. Also figured in Le Jardin Fruitier du Muséum [JFM vol.4/1861] and Pomona Britannica [PB pl.LXXIX/1812]. 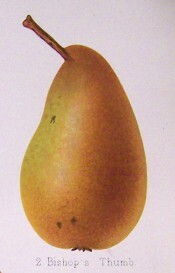 Listed in the 1850 and 1857 catalogues [Pear no.17/1850]. ‘17. May-June. Very prolific bearer, fruit hitherto dry and of very inferior quality.’ [Diary B, MP A2951/1862].